100 Face Challenge: Mooooooo (#9)! How can anyone resist a face like this? Love the soulful eyes of a cow. I just need to try and sidle up to one so I can get a nice cow eye, closeup! hehe. I’m doing lots of quick sketches of different animals, experimenting with orientation and such. This one is brought to you by the humble Indian Red polychromos colored pencil and an even more humble Canson sketchbook. Happy Thursday. I say we dance now. Who’s with me? < 100 Face Challenge: Less is More Experiment (#8)! I can feel his/her breath! 🙂 Love it Laura! And I just adore this perspective of a partial face! I’m so glad, thank you Jodi! Partial faces are becoming more and more attractive to me. Glad you enjoyed! Be careful dancing in the barnyard. You may get drooled on by a cow! You pic is so CLOSE! Dance in the field with the cows! 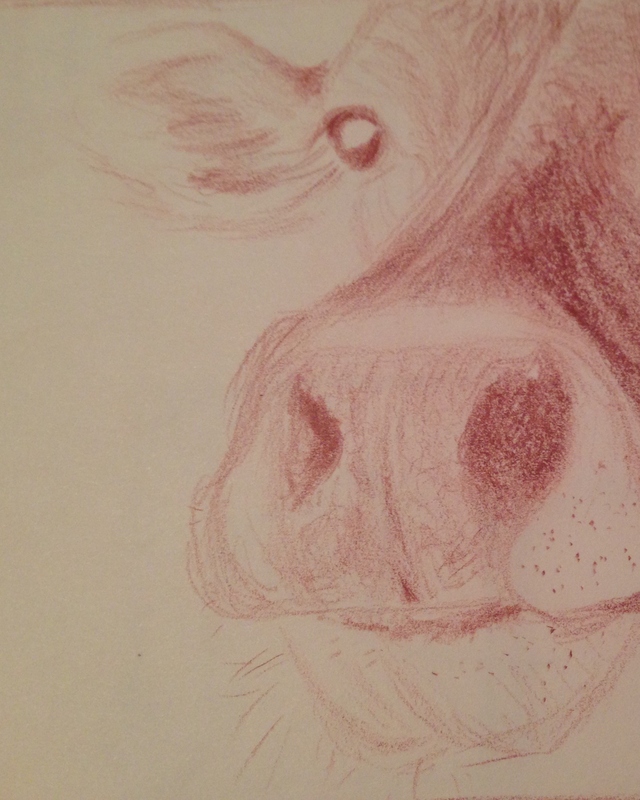 I love your curious cow, the red pencil was the right choice! I will post a bird tomorrow, and I posted one today! Chirp!! WOOT! Thank you so much, Sharon! You are awesome! Wow, loved your flicker today! Love the close up composition. So effective. Teri, thank you so much! Really appreciate your comments and visits! great sketch. Good capture of that nose. And, of course, the eye! Love the cow sketch and thanks for the reminder. I hope I can finish this bird painting in time. Oh, I hope so too, Catherine! I hope so too, Teresa! I’m so glad you enjoyed it! How now brown cow – love it! hehe! So glad you did, C! Your work could never not inspire me, Ann. I really would so love to paint with your delicate hand. It is some lovely stuff coming from your paintbrush, woman! Sweet, I love the soft and graceful way you’ve captured this gentle bovine. Thank you so much. So much gentleness in the eyes, and I’m so glad you see that. Thanks! Thanks Charlie! Can’t wait to see your doodlewash! You have a definite talent for faces, of all kinds! Love the cow nose popping out of the page! Thanks, Rachel! I found a cool closeup on google images and cropped it. I’m experimenting with thumbnails. Another new thing. Art is full of new things for me! :))) I’m so glad you like it! Value sketches/thumbnails are so useful. Good job! They truly are! Thank you! Didn’t I see a cow at your place last night? My memory is pretty junky but I feel like you’ve been doing them too? They are fun. Bodies would be harder for me than the face. You are right, I finished my cow and calf. I agree bodies complicate things…. Trying hard to change my avoidance, starting with horses, after years of heads only, I have discovered they have legs! And horse legs are tough too. Everything about a horse is tough! A fun challenge, though. Legs! Yuk, had trouble with one tonight, under painting! Best thing is to Find a nice head shot, neither straight on, nor side but somewhere in between . Or one from behind with the head peeping round is nice ( I still have not taken one to my liking at this angle). I guess if it was to easy, we would not keep trying? You are so right! I’m really glad for the challenge – seems endless! I love your energy! The face today is wonderful….the way you have positioned it on the page and the proportions!! Really nice and very brave to do a 100 faces….wow! Gonna be cool when you are done! Thanks Rebecca! I really feel like this focus is the direction I should be heading. It’s felt right in my gut. So I’m going with it. Need to add more people, but I do plan to do this soonish. Love the curiousness you portrayed, Laura, he/she’s adorable! Thanks, Donna! So glad you like it! Thanks so much! I have been drawing daily for almost a year and that’s it. I could never draw before. Practice makes all the difference. So glad you enjoyed this! you have a real gift! so enjoyable to find your art! and I to yours :)! !